Hello!!! This application contains very sweet new year messages and images. 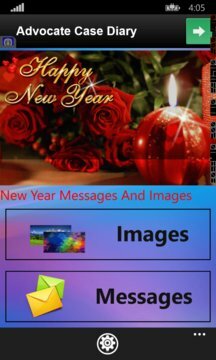 When you download the application you will get many new year greeting cards to send your mates every day. You may be interested to send a very good new year wishes to your friends and relatives to keep them happy. We have new year quotes and messages for you free of cost. New Year SMS or New Year Message or New Year Wishes or Happy New Year Messages are no doubt the simplest and cheapest ways to greet and wish your loved ones in a fraction of seconds at the beginning of the year. Wherever you are, you can still send sweet New Year SMS Messages to your loved ones on the occasion as big as the New Year. Given here are some beautiful and humorous New Year SMS that you may use to express your good wishes for your friends and dear ones. Apart from New Year good wishes SMS and New Year SMS, the collection also includes some popular New Year SMS in Hindi. You may help us enrich this collection of New Year Text Messages by sending us funny and heartfelt New Year SMS ideas. Now have a look on this application functionality : 1) Most important is internet connectivity is required to get new year images and msgs access from our server. 2) You can share top new year msgs with the social media application like whatsapp. 3) You can download the images from the server. 4) You can share the new year pictures after downloading the images on social media. 5) There is rate us option if you like our work please rate the application. 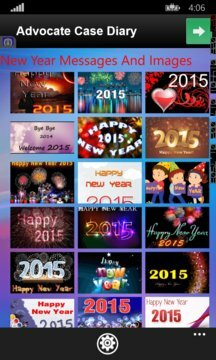 If you are searching an app to send new year to your friends,this is the best app for that. It contains a lots of nice collection of messages and pictures that you can send to your friends and relatives. So enjoy with the app and please give me suggestions to improve it by sending me email. So download the app now and enjoy.Thanks a lot.